It's that time again! Linky Love!! I have some fun things to share with you from last week's Frugal Friday party...so fasten your seat belts!! The Painted Hive shared this amazing modern light fixture redo...so chic! And... For The Love of It shared a darling girly chandelier makeover...this transformation will blow you away! Savvy Southern Style shared a pretty birdie bedroom...you just know I have a weakness for birds! And talk about upcycling...check out this women's skirt turned table skirt...very clever! 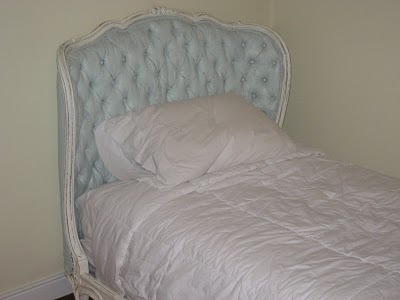 Finally, this french bed redo from Primitive and Proper made me drool. Le sigh. If you haven't had a chance to check out the Frugal Goodness that is last week's party, click here. Thanks Wendy for highlighting my Chandelier redo. You posted about the endtables I redid a few months back. I love joining your linky parties. Have a great day!!!!! I love the lights! Great stuff here. I so love linky round ups. :) Thank you!! "You made my week! Thank you SO much for your sweet comments & for loving my blog which is still very much a work in progress. I actually designed the website (I have a limited graphic design background from my college days). The digital linen came from www.thegraphicsfairy.blogspot.com which I used to Photoshop a blog background. So happy you like it. I tried to keep things crisp and simple considering all the other sidebar gadgets & posts that clutter up a blog. I love your blog for the very same reason. Have a great week. I know I will! wow- thanks so much for featuring my bed! i love joining in your party and love all the ideas i get from you and the crafty people who share ideas here. thanks for hosting! Thanks so much for highlighting my guest bedroom! okay i've scolding myself for being so unproductive... geesh look at these amazing ideas... the sun and swimming must be turning my creative brain to mush! Thanks for the shout-out Wendy! I was so hoping you would choose my light redo and was so honoured when I saw you had - thanks a bunch! Love all the other projects too.